Leaders have a great responsibility to practice the behavior they would like others to follow, and in this interview series, we will be asking the leaders presenting at the International Summit on Leadership in Healthcare to share their insights and perspectives on this responsibility and what made them the leaders they are today. Dr. Jens Van Roey is director of Global Clinical Development at Janssen Global Public Health (previously Tibotec), a Belgian biotechnology company focusing on the clinical development of drugs for HIV and infectious diseases. He trained at the Katholieke Universiteit Leuven, and began his medical career with Médecins Sans Frontières (MSF) in Cambodia. After this formative experience in South East Asia, Dr. Van Roey spent 15 years in Africa as a general practitioner, where he founded the Centre for the Physically Handicapped in Kikwit, Democratic Republic of Congo. Dr. Van Roey has been actively engaged, both personally and professionally, in the fight against AIDS since 1990. He serves as a member of both the Scientific Advisory Board and Access Advisory Committee at IPM, and was a member of the International HIV/AIDS Alliance’s Board of Trustees for almost 17 years. Working for Janssen Global Public Health, Dr Van Roey is passionate about increasing access to life saving treatment and drugs for patients in developing countries. Working on initiatives to complement the scientific advancements of the Janssen Pharmaceutical Companies of Johnson & Johnson, Janssen Global Public Health fosters collaborations and supports public health solutions to sustainably advance healthcare worldwide. The early days of Dr. Van Roey's medical career in South East Asia and Africa directly influenced this guiding principle in his work, and he believes that practicing as a doctor in these two parts of the world directly influenced his leadership style. "It was learning by doing. Failure after failure, you discover that you need to change your mindset. There are too many bright people around, too many community members that are more knowledgeable of local issues than you." This "learning by doing" experience shaped Dr. Van Roey into a leader who recognizes the expertise of those around him, and who believes that good leadership entails "creating space for colleagues and team members to take initiatives and stimulate them to think out of the box". Bernadette Clement and Dr. Jens Van Roey accepting the Johnson and Johnson CSR Trust Award for the Caring Together project in 2015. "Today’s healthcare services have become too dependent on technical solutions and common sense is lost. Dollars and cents are too often seen to be the only solution to improving services but to me, the first and most important piece of the solution is the human factor. In Flemish we have a nice proverb, 'what do spectacles and candles help if the owl doesn’t want to read?' We need to have empowered health care staff that can organize themselves and take the right decisions that are locally relevant. Therefore you need a captain to steer the ship, a leader to drive the passion of the team and a team that is executing based on their own understanding of the issues. At the end of the day, local staff are the closest to the community and in the best position to understand what the needs are." Dr. Van Roey has been the captain of many different ships working to improve healthcare access worldwide, and cites the development of the Dapivirine vaginal ring and his introduction of the concept of 'Greater Involvement of People Living with HIV' (GIPA) to the private sector as his greatest achievements to date. "The availability and affordability of the Dapivirine vaginal ring to all women in Africa for the prevention of vaginal transmission of HIV is my dream. By the end of the year we will know whether this dream is being fulfilled, after a positive opinion from the European Medicine Agency and approval by some African countries." The idea for this medical innovation came from his experience as a medical doctor working in Africa in the 1980s/1990s. 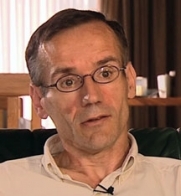 Dr Van Roey "was confronted in the early days of the epidemic with the extreme morbidity and mortality caused by HIV. But within a couple of years it became clear that women were taking the greatest burden. They were most confronted as they are the caretakers of the family. Additionally in the context of male dominated sexuality there were little or no options for women to protect themselves. A female controlled prevention tool was urgently needed." Though the spark for this incredible idea came from Dr. Van Roey, he insists that "the rest is team work! During endless discussions ideas get launched even without realizing that you have a new idea. It is this freewheeling and allowing the team to think out of the box that enables innovation." Living with HIV himself, Dr. Van Roey is incredibly proud to have played a role in bringing perspectives of patients to the fore in the pharmaceutical sector. "Thanks to visionary people like Paul Stoffels and Rudi Pauwels I was able to bring perspectives and experiences of individuals being infected or affected by HIV to a team working on therapies for HIV. It provided better insights and understandings of the problem, as well as the creation of a dedicated, compassionate and successful team, leading to optimal therapies in the fight against HIV." This leadership style, focusing on the importance of teamwork rather than the individual, was influenced by two formative people in Dr. Van Roey's life, Pol and Paul. "As a young doctor I did my internship in Kikwit, RD Congo where Pol was the only MD (medical doctor). Pol was an incredible leader that managed to create structure where there was chaos, and who instilled in all collaborators the sense that we can contribute to a better result, which in this context was better health services for the community. At the same time, he made himself available to individuals in the team on a personal level, and provided comfort to those who faced personal challenges. Amazingly, some years later I was in Pol’s position at the same hospital and my place as the medical student was taken by Paul. This time my learning would only come years later when Paul offered me a challenging opportunity: to join his team at a pharmaceutical company and make sure that the needs of African HIV patients are considered in the development of new HIV therapies. This was an incredible gesture of trust and confidence in me but at the same time, I was certain that he would support me no matter what. He was willing to take the blame if something went wrong - what a strong signal of trust! This sort of attitude by Paul as a leader made it possible to kick-start an unprecedented initiative within big pharma: the development of a female tool for the prevention of sexual transmission of HIV. Indeed, such profound trust received from Pol and Paul during my career can only translate in lifelong friendships and these friendships have had an incredible impact on me a person and as a leader." Ever humble, Dr. Van Roey's advice to others starting out in positions of leadership is to understand that "most people are smarter than yourself. Listen more, enable more, and take time to learn from your failures." A truly inspirational individual, both professionally and personally, Dr. Van Roey remains positive in the face of adversity. His story is one that we should all take motivation and courage from. "I learned from my own adversity in life - my health story reads as a muddy road! From these major life threatening situations I learned never to give up and always see hope. Never take a fight on your own as a team always performs better. Even in facing HIV, it was the support of family, colleagues and friends that made me survive. Isn’t this the best example of the need for a good team! An important lesson is indeed don’t keep problems for yourself, share and open up, others will come to your help." We look forward to hearing about Dr. Van Roey's involvement in the Caring Together project at the Summit on the 25th of April. Filming continued in Eastern Region last week and the team had the pleasure of travelling to Kumi and Soroti Districts. Dr. John Opolot, District Health Officer of Kumi District, is a passionate champion for the Caring Together project. Retiring in June this year, he told the team that he wishes he had longer in office to advocate for the inclusion of Caring Together modules and tools in national curriculum for medical students. Facility staff in Soroti District also advocated for the scale-up of the project to the rest of Uganda. Helen Aleppo, Facility In-Charge of Mukongoro Health Centre III, has been a Caring Together mentor since 2012. Helen attests that Caring Together made her "innovative". Helen has used the skills she learnt as a mentor to advocate for change and better amenities and services in her facility, and the facilities that she mentors. She has campaigned for new floors, for more training and more supplies for the facility staff that she works with. She is an inspiration to all who are privileged to know her, and she told the team that Caring Together helps her to run her facility efficiently everyday. Kokas Opolot is another inspiring 'Super Mentor' from Eastern Region. Inspired by the Time Management module, Kokas decided to communicate with his fellow staff at Apapai Health Centre IV who worked with him in the Antiretroviral Therapy (ART) clinic to try find solutions to the problems they faced as a team. Patient waiting times for HIV+ clients at the clinic were a persistent problem for the team, and Kokas realized from the Caring Together Time Management module that "Time equals life. Waste your time, and waste your life." He persuaded the team, using this lesson, that if they arrived to work by 6.30am on ART clinic days, they could help more patients, and reduce their waiting times, before their other duties at the health centre started. Service at Apapai HCIV improved so much at the ART clinic that Kokas and the team started receiving gifts from the clinic's patients! Kokas has received many awards in recognition of his amazing leadership skills as a frontline health worker and he is an inspiration to us all. The Caring Together team, together with DFH Uganda, have been busy in Rwenzori Region filming a video to be premiered at the International Summit on Leadership in Healthcare! The team visited Kabarole and Bunyangabu districts in Rwenzori region, and had the opportunity to talk about the impact of Caring Together with mentors, ambassadors, facility in-charges, and district leaders including DHO Bunyangabu. Those interviewed for the video unanimously called for the scale up of Caring Together to all regions in Uganda and for the continuation of the project in their districts. They demonstrated the integration of Caring Together indicators and targets into district work plans and assured the team that the work done by the project would continue even after its close. Soroti and Kumi in Eastern region, here we come! Please click on the photo above to see more. As preparations for the Summit are underway, the team have been reflecting on the importance of leadership for health care system strengthening in Uganda. Leadership and Governance is part of the six WHO health system building blocks, the WHO Ouagadougou Declaration for health system strengthening, and WHO's Vision 2020. The International Leadership in Healthcare Summit will be a platform to share strategies for success for the successful implementation of leadership and governance strategies throughout Uganda and the wider world in the context of improving healthcare indicators. Developing the leadership capabilities of frontline health workers in Rwenzori and Eastern regions in Uganda has been the mission of Baylor Uganda's Caring Together project, supported by Janssen and Pepal, for the past three years. This will be one of the strategies for success shared at the summit.